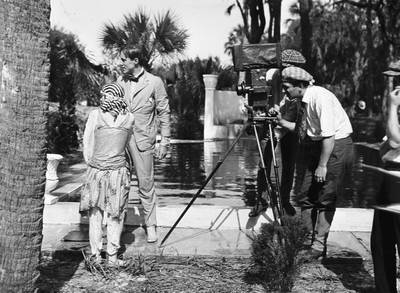 Black and white images of the first Technicolor production “The Gulf Between,” shot in Jacksonville, Florida in 1917. Another title given to this film was “The Little Skipper.” It was directed by Wray Bartlett Physioc, with cinematography by Carl Louis Gregory. “The Gulf Between” was filmed on location by the Technicolor Motion Picture Corporation, using its two-color "System 1", in which, by means of a prism beam splitter, two frames of a single strip of black-and-white film were photographed simultaneously, one behind a red filter and the other behind a green filter. The lead roles wear played by Grace Darmond and Niles Welch. The story was about a girl raised by a sea captain and her rejection by the wealthy family of the young man she loves. BW film negative; 3" x 4.5"